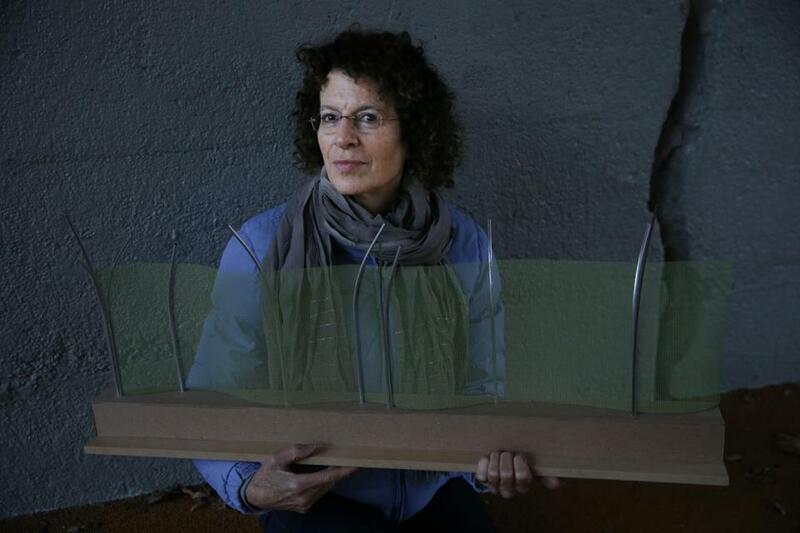 Beth Galston held a model of the fence that she designed for the new Green Line station. In an attempt to save money on the Green Line expansion that could cost nearly $1 billion more than estimated, MBTA officials have pulled the plug on eight public art projects that make up a fraction of a percent of the project’s construction costs. MBTA officials scrapped the public art projects for the seven stations as officials search for ways to cut costs on the Green Line project, which has faced criticism in recent months for its ballooning price estimates. Randal Thurston, a Somerville artist, said he has been designing his piece for the new Lechmere Station for 17 months and has already been paid three-quarters of his $60,000 contract. The elimination of the artwork sends a bad message to the Boston region about the government’s support for the arts, he said. “It’s a waste, it’s short-sighted, and I think it’s wrong-headed,” said Thurston. The long-awaited Green Line project would extend 4.7 miles of track into Somerville and Medford, along with seven new stations. Though the federal government has already pledged nearly $1 billion to the project, MBTA officials are scrambling to afford it after they revealed they may need nearly $1 billion more than the estimated $1.99 billion price tag. The method allows a contractor to name a maximum price at each stage of construction, instead of agreeing to a fixed price. Officials had budgeted about $1.9 million for eight art projects, including a massive glass window decorated with paintings for the Ball Square station and a billowing stainless steel fence for the Gilman Square station. None of the art pieces had been constructed yet. Under signed agreements, artists were to be paid $60,000 per project for designing and overseeing construction of the pieces; the rest of the money would go toward building the art. So far, the MBTA has already paid $208,500 of $420,000 to artists for their work. But some artists said they were shocked because the $1.9 million art budget is mean to be less than half a percent of the total cost of the stations. Christine Vaillancourt, a local artist who was working on the Ball Square station artwork, said she had always known about the Green Line extension’s cost overruns, but thought officials would address larger parts of the construction costs. “I never thought it would affect the art because we’re such a small, small piece of the project,” she said. Others lamented the effect on the public, especially after the potential demise of another public art program. When Margaret Lackner, the MBTA’s design director, told the artists in a group e-mail on Nov. 17 that officials were cancelling the projects, she didn’t blame the Green Line extension costs. Instead, she said the MBTA was simply following Baker’s lead: She sent a link that showed the Republican governor had vetoed a public art initiative called the Massachusetts Percent for Art program, which would dedicate capital funds from the state for public art. “We had all hoped to see your visions implemented, but this cannot happen without an outside funding source,” she wrote. Mary Lucking, an artist from Arizona who used to live in Somerville, said not having art at the stations would be a huge missed opportunity. Beth Galston, of Carlisle, said the MBTA should have encouraged more art in public spaces, rather than delivering a blow to the region. “They’re losing the opportunity to have some artwork that’s accessible to all, that unifies the neighborhood, and brings a better quality of life to the people who use the transit system,” said Galston, who was working on the Gilman Square station. Artists first applied for the project in August 2014, then went through rounds of judging and attended community forums in the neighborhoods of the new stations. The MBTA encouraged artists to create projects using the same materials used in construction and pieces that would become integrated within station fixtures. For example, part of Thurston’s project involved printing images of birds in various migrating patterns onto the windows of the relocated Lechmere Station. This summer, the artists were told to halt their work because of the controversy surrounding the Green Line project’s cost estimates. But artist Nancy Selvage was still shocked that MBTA officials would go back on their agreements. “The fact that one had a contract made one assume that there was funding in the background,” said Selvage, who lives in Lincoln. The agreements were structured so that artists would be paid in phases. So far, Selvage has been paid about $6,000 for her piece, which would have created an aluminum sheet metal fence to camouflage an aqueduct at the College Avenue station. 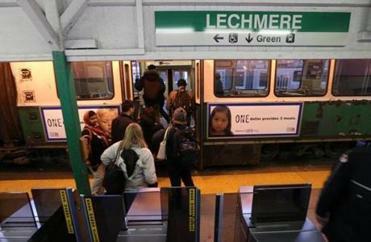 The MBTA has said it would welcome private funding for the projects. Selvage called the loss “devastating,” and is still hopeful someone will take the agency up on the offer.